Do the advantages of locating production near the point of consumption outweigh the region's drawbacks? How Safe are Latin America's Market Leaders? The rising price of oil, driven by dwindling supplY and mounting demand from China and India, will kill globalization as we know it, writes Canadian economist Jeff Rubin in his 2009 book Why Your World Is About to Get a Whole Lot Smaller: Oil and the End of Globalization. If oil is cheap, it doesn't matter how far factories are from showrooms, Rubin observes. Other expenses, such as labor and taxes, determine where companies manufacture products. If oil is expensive and scarce, however, the equation changes. Rubin believes the world has now reached this inflection point. Reports from the trenches confirm his observation. 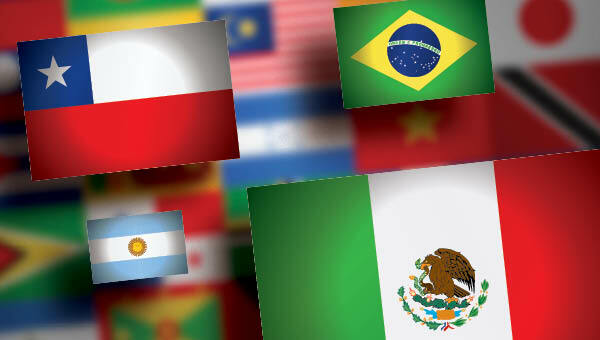 To gauge business leaders' perceptions of Latin America's risk and safety issues, research organization Nearshore Americas surveyed 266 outsourcing decision-makers and influencers in North, Central, and Latin America. Here are its findings on four of the largest Latin American markets. 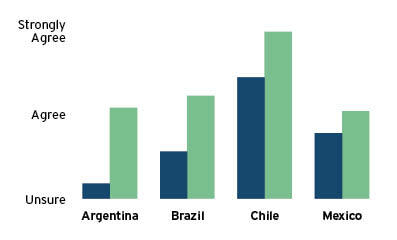 Argentina "Known for its bureaucratic red tape, nepotism, and an administration that seems uninterested in the professional services and sourcing industry as a whole, there is no doubt—based on the survey results—that Argentina still has an image problem," the Nearshore Americas study states. Thirty-eight percent of respondents strongly disagree or disagree when asked if the national government is actively involved in creating a safer climate for businesses and business investment. Argentina did score well on personal safety, with 71 percent of survey respondents rating personal safety as high or very high. Brazil Despite ongoing violence in Rio de Janeiro, 54 percent of respondents with outsourcing interests in Brazil continue to rate personal safety at a high or very high level. "Brazil has other advantages, such as its large and scalable workforce and talented labor pool, that count for much more," comments one industry analyst. In terms of the role government plays in creating a safer climate, 85 percent of respondents feel that political stability and democracy in Brazil are at a high to very high level. The strong trade links and political cooperation between the United States and Brazil, particularly under the current Brazilian government, will likely make North American companies more comfortable doing business there. Chile Chile was ranked the safest country in Latin America by a majority of survey respondents. Civil unrest or violence was rated of very low to low concern by 80 percent of respondents, while street crime/petty theft was rated very low to low by 74 percent. Chile's strong economy, high literacy rates, and sizeable copper wealth contribute to its positive safety ranking. Other reasons given by outsourcing buyers surveyed include the efficient courts and judicial system, uncorrupt law enforcement, and the high level of education and technological development. Respondents also have a favorable view of Chile's government, with 73 percent rating the level of political stability as high. Notably, Chile's outsourcing action is largely concentrated in two cities, Santiago and Valparaiso; these rankings reflect only the situation there. Other parts of the country continue to struggle with poverty and income inequality. Mexico The United States' closest southern neighbor offers numerous outsourcing benefits, including time zone alignment, U.S. cultural familiarity, and a well-educated, bilingual workforce. More than 64,000 students graduate annually from Mexico's 121 technology-focused universities—more than any other Latin American nation. The country suffers from an image problem because of drug cartel-related violence, however, and the U.S. Department of State has advised Americans to defer non-essential travel to vast stretches of Mexico. Yet while cities close to the border, such as Juárez, are experiencing violent disruptions, other locations, including Guadalajara and Mexico City, continue to provide some of the best sourcing alternatives to U.S. companies. Currently, Mexico has not seen a drop in investment or companies pulling out, but if the drug war continues, new business may suffer. Survey respondents express confidence in the Chilean government's stability, but lack faith in Argentina's leaders. Blue - The national government is actively involved in creating a safer climate for businesses and business investment. Green - The country's government is stable and democratic. The decision to nearshore manufacturing is highly complex. "A modeling tool can help evaluate the variables," says Tom Page, director of customer solutions, international regions, UPS. "Modeling must include some understanding of currency fluctuation probability, low and high threshold, and how currency fluctuations contribute to overall sourcing decisions. It has to incorporate sensitivity to all decision factors." While many models are effective at quantifying the hard costs of positioning product in a market, they may not excel at calculating the value of supply chain flexibility, which could generate additional revenue and profit. "The model should be able to assess the opportunity an investment or decision can create, and how much that opportunity is worth," notes Page. "If you take on more cost, but can generate more revenue as a result, for example, you increase profit. But does that profit boost offset the cost of the decision?" Even with sophisticated modeling tools, production-sourcing decisions for many products are not perfectly clear. "The fundamental concerns are reliability and consistency—how your decisions affect your ability to serve customers," says Page. "You can have the lowest costs but fail to understand your risk exposure adequately. If an event shuts down your supply chain, all savings are destroyed by a failure to understand those risks and model their sensitivity."